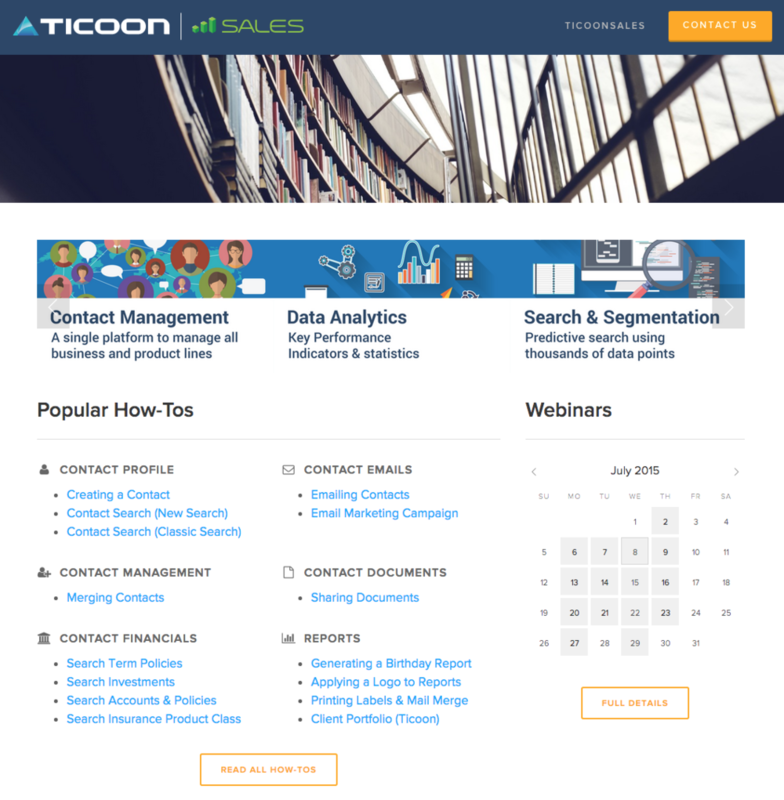 With the launch of its new Resource Centre, Ticoon now offers users of the TicoonSales platform a rich collection of on-demand support resources. Instructional videos along with detailed step-by-step guides and a full suite of live webinars are offered to help users take full advantage of the powerful Ticoon toolset. A collection of short “how-to” videos make it easier to master the Ticoon toolset by providing simple explanations of how to manage contacts, search and segment your clients and leverage client data you already have in order to drive new business opportunities. The Data Analytics video above explains how advisors can use existing data about clients to identify new sales and service opportunities. Documentation and support resources for doing just about everything on the Ticoon platform have been significantly expanded with the launch of the new Resource Centre. If you are currently using another contact manager, Ticoon offers detailed instructions for easily migrating your contacts from virtually any other platform, including customized instructions for ACT, Goldmine, Maximizer, Outlook, Salesforce and others. Once your clients are loaded into Ticoon, you can use the platform to communicate securely with clients about their accounts, as well as send marketing campaigns that are fully compliant with Canadian Anti-Spam Legislation (CASL). One of the most popular features of the Ticoon platform is the client portal. Clients can login and view their holdings and communicate with their advisor securely, similar to online banking sites. The Resource Centre offers detailed instructions for how to set up and invite clients to a portal site branded by the advisor. Ticoon offers a full schedule of live webinars featuring product support and how-to instruction. Ranging from how to search client data for business opportunities to how to manage email marketing campaigns using the Ticoon platform, live webinars make it easy to learn how to use the platform effectively. All of the support and educational materials on the new Resource Centre are included with your subscription to TicoonSales. Contact Ticoon for more information on the Ticoon Resource Centre or to speak to a sales representative about how you can generate new opportunities in your business using the Ticoon platform. Newer PostDoes the silo-based regulatory compliance model really work for advisors or consumers?